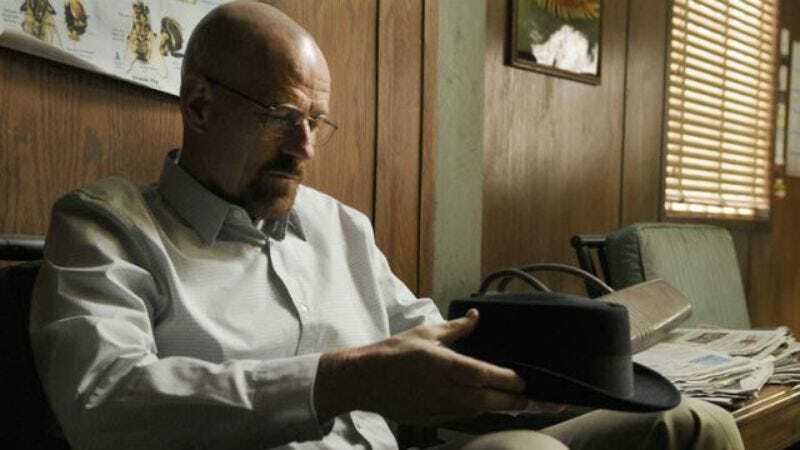 Bryan Cranston has just shed a piece of his Walter White persona and donated it to the Smithsonian—Variety reports that the iconic Heisenberg hat and two hazmat suits that Cranston and Aaron Paul’s characters wore on Breaking Bad have just been donated to the museum. A ceremony was held on Monday to recognize the donations from Sony Pictures Television, which produced the series. The porkpie hat and Tyvek suits are the latest additions to the West Wing, which currently holds such notable pop-culture memorabilia as Fonzie’s leather jacket, Archie Bunker’s wing chair, and the puffy shirt from Seinfeld. Cranston was joined by the show’s creator and executive producer Vince Gilligan, as well as many members of the cast. Naturally, this unofficial Breaking Bad reunion prompted reporters to ask Cranston if he’s keeping up the antihero tradition in his portrayal of Vince, a character from the Sneaky Pete series he’s producing for Amazon. You’ll be happy and/or unsurprised to learn that he said yes.